Before he started working for TV’s Lost and before his amazing PRIDE OF BAGHDAD Vaughan wrote some pretty fun Batman tales. I love his work on Ex-Machina and Y The Last Man is wonderful but seeing him work in the DC sandbox with established characters is a real treat. The first two tales are Batman, one with an identity crisis involving his long time under cover alias Matches Malone. It’s great background on this long running aspect of what Batman does and it’s an interesting character study as well. The second story is really my favorite, the Mad Hatter is running a series of crimes using other villains done up as characters from Alice In Wonderland. But things are not what they seem and Batman working it out is sheer poetry. The collection wraps up with a Wonder Woman two parter that has her facing Batman foe Clayface who has come up with a really clever way to mess up the Amazon Princess. All in all this is a really fun book, great writing and a real love for the characters added to some damn fine artwork by Scott McDaniel and Rick Burchett and Scott Kolins make this another volume that needs to be added to any Batman collection. 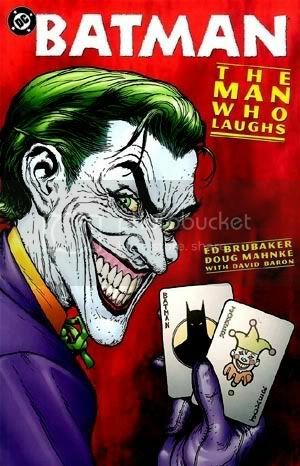 This is a wonderful collection of Batman stories and as the title suggests, Joker is prominent. It’s all written by Uber Fan Favorite Ed Brubaker. The first half is an arc with a new to heroics Batman taking on a new to psycho crime Joker. Joker is killing people and even announcing when they will die, yet it’s all the Gotham Police can do to keep up. Batman is frustrated, but in his true relentless fashion manages to eventually capture and put away Joker. The second story is a really classic kind of Batman story. An old murder mystery and Gotham’s first hero, Golden Age Green Lantern haunted by it put Batman’s skills as a detective to work. Brubaker does great crime stories and I think this is a wonderful example of why Batman is more than just a superhero in the hands of the right author. The story actually feels a bit Ed McBain-ish to me, and that is a real compliment. Brubaker has added to the legend of Batman and added to the myth in a powerful way. This second collection moves quickly and adds an awful lot to the mythology that Carey is creating here. Toshi has become a servant to Lord Aratsu and she is learning her new duties in a way that doesn’t allow much room for error. Because of the changes she’s gone through she now sees things in the world that most people don’t even know exist. Her job is to cut loose parts of dreams from people and collect them, however while this seems like an easy job at first she quickly learns that she is not the only servant out there doing the bidding of a master. She has a confrontation with a servant of the Gleaner which leads to a major battle. While all this is going on , Toshi’s brother Kai is drawn to Tokyo and while searching for his sister he too learns things. He stumbles across evil and supernatural beings he didn’t know were there and he is heading down a new path. Carey is creating a wonder fantasy world here and his use of Japan as a setting is inspired. It has all the elements great story telling should have, and most important, it leaves me wanting more. The artwork is crisp and colorful, and yet seems almost translucent at times. It’s a perfect match. Kudos to Jim Fern and Eric Nguyen. This volume wraps up the run of this great series collecting issues 24 through 30. It ends with a cliff hanger and I’ve heard rumors that it will return. I hope so. This volume was really fun, Kate Spencer has left the DA’s office and is practicing as a defense attorney. The book opens with her defending a true nut job supervillain, and while she actually won the case, a flair for villainy and escape make the matter moot. After this great opening Kate is approached by Wonder Woman who would like to hire Kate. While taking on this illustrious client she also gets to train as Manhunter with WW and hone her ever growing skills. And while after all the great action and story telling we still have a bit of a cliffhanger this really does finish nicely. Kate is happy with where she is and who she is, her friends and family seem safe and happy as well. Of course in comics that leaves plenty of room for fresh stories and new misery. What really makes this work is the fact that Kate is so human, she really does want justice but has come to understand that some cases demand more than the law. Her struggling with that really makes this intriguing. Our intrepid hero has shown up in some other comics, so she’s still around, but I for one would love to see her in her own book again. Meanwhile there are four great trades of wonderful reading out there. 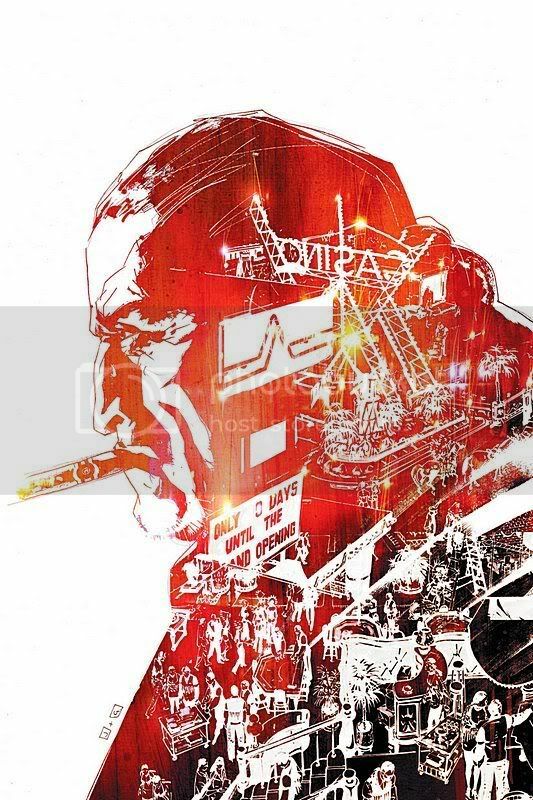 This second volume collecting issues 6 through 11 of Scalped continues the story of FBI Special Agent Dashiell Bad Horse who has gone back to the reservation he grew up on, He’s undercover working for Lincoln Red Crow who is the tribal leader and also runs the brand new casino. Bad Horse has a past with most of the people living at Prairie Rose Indian Reservation and his home coming has been met with mixed feelings. In this second volume the collection of stories each tells a different vantage point of the opening night of the casino, each seen by following a different character. It seems that everyone in this book is playing a game on someone else, the FBI agent running Bad Horse has his own agenda that goes back years involving his partner being killed. There is also another undercover agent that Bad Horse doesn’t know about. Layers upon layers of lies going on all around him, and Dashiell has motives of his own for being there and trying to stop the illegal activities. The story telling here is gritty and honest, it’s a new type of noir and the best word to describe it is brilliant. The characters have a unique voice and while Aaron tells his story you can pick up on subtle social commentary underlying the action. R.M. Guéra’s pencil work is so perfectly matched with this book that there may be a psychic link between him and Aaron. The visuals are visceral and detailed and yet not over stated. The action scenes leap off the page and you can feel the heat when the characters sweat. This is a perfect example of why comics work so well for crime fiction tales. I hope this series never ends.